Previous rumors that Amazon is adding new 7- and 10-inch models to its Kindle Fire line of tablets have been further teased by a new report. In the report, a "trusted" anonymous source claims that Amazon is readying two new Kindle Fire 2 models for release this summer, one of which is the long-rumored 10-inch Kindle Fire. The 10-inch Amazon Kindle Fire 2, according to the source, will come packed with a more powerful quad-core processor. 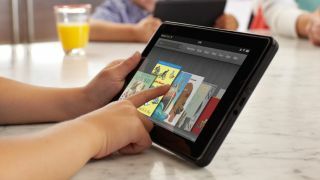 Both new Kindle Fire tablets will reportedly be of higher-quality materials and more ergonomic designs. The original Kindle Fire's plastic body is being replaced by matte black metal, with a shiny, chrome-like "rib" on the back that looks sharp and feels better. The speakers are supposedly located here as well. "It's really up a notch from the current Fire," claims the source. Furthermore, the report says that Amazon's new Kindle Fire 2 tablets will be thinner and more similar in appearance to the first-generation Apple iPad, but without any buttons on the front. In addition, the 10-inch Kindle Fire will house a front-facing camera, and both new tablets will include microUSB ports and, possibly, HDMI-out jacks, says the report. Google had the Amazon Kindle Fire in the crosshairs yesterday when they revealed the Google Nexus 7 tablet, a $199 device that focuses on media playback via the Google Play store. As far as price and functionality go, Google's Nexus 7 tablet can easily compete with the existing Kindle Fire. And the Nexus 7's specs surpass those of the Kindle Fire. But until Amazon reveals more about the upcoming 7- and 10-inch Kindle Fire 2s, it's unclear which tablets will come out on top. "The whole tablet market is due for a radical change over the next one to two quarters," J. Gold Associates analyst Jack Gold told TechRadar earlier this week. It looks like his prediction may prove to be spot-on.